No one is actually forced to drink a beer at a baseball game, but if someone's interested, major league teams have been known to put an emphasis on accommodating. Fans seated in the bleachers of a White Sox game are bound to become very familiar to their assigned beer vendor over the course of nine innings, but they are also bound to gain a passing familiarity with the two other vendors in the adjacent sections who slide over every now and then, also lugging around Miller Brewing products, to make sure no one is missed. Even an interval as long as 10 minutes is treated like a wasted opportunity. But that is only indicative of the emergency coverage major league ballparks provide, for those fans too locked-in to the actual game to explore the actual full beer selection available. These days, that full beer selection inevitably has a section dedicated to, at the very least, paying lip service to the growing popularity of craft beer in the United States. It is a response to an industry that soaks up 6.5 percent of all beer sales nationally by volume and 10.2 percent by dollars according to the Brewers Association, and is enjoying an increase in market-share while nationwide beer sales are sagging. Just in Chicago, the fourth annual Chicago Craft Beer Week finished an 11-day string last month that included nearly 400 separate events across the city. The rapid acceleration of the industry has opened opportunities up for craft beer brewers like Mike Cohoon, co-founder of Chicago Beer Co., a brewery he started with his brother Kevin in 2010 that is now reaping the benefits of being in the right place at the start of a boom. Even for organizations as slow-moving and risk-averse as major league baseball franchises can be, the kitschy trend possesses too much power, too much obvious momentum and too much traction with other establishments selling beer to simply be ignored. The progression is sporadic and dependent on region, individual contract situations and logistical concerns, but MLB franchises are steadily responding with designated pockets of craft beer service. The Daily Meal's recently published list of the top-10 MLB stadiums for craft beer was critical of the state of beer selection across the league but highlighted the strength of the market on the West Coast, in Colorado—where independent distribution is legal—and even in Midwestern cities such as Detroit and Milwaukee. For as much negative attention as the New York Yankees garnered in April for a craft beer stand devoid of any true independent options, the fact that they felt the need to pretend to be part of the the trend, as well as the widespread criticism and mockery their efforts elicited, were both very telling statements on the strength of the craft brew craze. With beer service already an inextricable feature in major league baseball parks, craft beer is forming an even stronger foothold with the portion of the baseball audience that embraces advanced statistics, also known as sabermetrics. Michael Lewis' 2003 book “Moneyball” on the success of the early-2000's Oakland A's and the subsequent Brad Pitt movie based on it is still what most think of when the practice of sabermetrics is mentioned, but these days every baseball fanbase is rife with members who are capable of and used to scrutinizing and quantifying the worth of every player on their favorite team. By most accounts and to the delight of craft brewers, this audience is willing to put just as much thought into their beer choices as they put into their baseball opinions. As one of the editors of the South Side Sox, a White Sox blog for SBNation.com that brings in upwards of 10,000 visits per day, Mark Primiano oversees an online community of fans who combine the two interests fluidly in comment sections that regularly stretch into the hundreds. Baseball writer Eno Sarris is not just observing this confluence, he's banking on it. Sarris, whose statistical-driven analysis and reporting appears on ESPN, The Score and, most prominently, FanGraphs (a website particularly responsible for pushing sabermetric ideas into the baseball mainstream) is continuing that approach to launch the website BeerGraphs at the beginning of June, which will seek to provide advanced analysis of craft beer. Despite jumping into the craft beer world no earlier than the Cohoon brothers did in 2010, Sarris, who admits himself to be a “total nerd about anything that I like,” has worked up his expertise by sampling over 500 different beers in the past three years and logging his drinking activity on Untappd, a social media application designed to allow users to archive and share their craft beer drinking habits over Twitter with other like-minded enthusiasts. 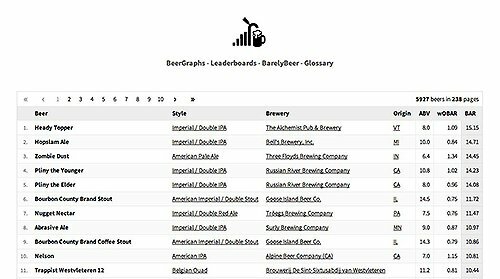 While crediting Untappd and social media for making beer consumption and selection a more public practice, Sarris will attempt with BeerGraphs to present information on craft beer in the manner that most people process baseball in: with an exhaustive supply of stats, leader boards and analysis. Instead of batting average, on-base percentage and slugging percentage, readers will find sortable listings of alcohol-by-volume, bitterness, color, as well as the opportunity to submit their own ratings. Given how much baseball writers have become accustomed—or even forced—to learn to work with and interpret data, it's no surprise that the vast majority of Sarris' initial writing staff is composed of them. It's a natural transition, after all. “Not everyone that drinks beer loves baseball, most everyone who love baseball drinks beer,” Sarris said. The White Sox don't show up on any beer wonk top-10 lists for their craft selection and they are certainly playing catch-up to a craft beer wave that has long since hit the West Coast, but they could easily represent an example of a franchise slowly reacting and responding to demand. Two dedicated Midwest Brews stands were placed on their lower concourse in 2011 to hawk the deepest cuts of the U.S. Cellular Field beer selection. Great Lakes' Brewing Company in Cleveland, Bell's Brewery of Kalamazoo, Lakefront Brewery from Milwaukee, New Holland Brewing in Michigan, Barley Island Brewing from Noblesville, IN, and in-state companies like Two Brothers from Warrenville and Chicago Beer Company are all represented in addition to separate kiosks for semi-craft brands like Blue Moon, Leinenkugel. It's not a perfect setup and none of it is available on tap, but it does get updated every year. Meanwhile, the Cubs embody to a fault the limitations and obstacles that every franchise has to face when trying to adapt to and accommodate new trends into their existing and long-established arrangements. As Mike Iacobelli of Levy Restaurants, the concessions vendor for Wrigley Field, told the Chicago Tribune, the Cubs are consistently limited in the amount of variety they can stock due to the space available in their nearly 100 year-old stadium, and most of what little space is marked out for their major domestic beer sponsors, Budweiser and the Pabst-owned Old Style. Wrigley only has craft beer available if the definition is stretched to the point of including Red Stripe, which at least used to be independently owned in Jamaica, or whether the Goose Island (the former Chicago craft success story that was bought out by Annheuser-Busch in 2011) that's available in the adjacent Captain Morgan Club counts. By the standards of the Brewers Association, neither is close to qualifying. The millions in advertising that Anheuser-Busch pays the Cubs as well as Major League Baseball and that Miller Brewing pays the White Sox to be their official sponsor affords them priority and a dominant presence in the ballpark. Joey Nigro, who has worked with Sportservice, the food and beverage vendor for U.S. Cellular Field, since 2006, claims to have more autonomy. “I sell what I want to sell” Nigro said when asked how Miller being the official brewer of the White Sox affects his decisions on what craft beers to stock. Sure enough, the White Sox craft beer roster is filled with independent companies, but Goose Island Honker's Ale sliding out of the the U.S. Cellular rotation after it was sold to Anheuser-Busch is noticeable. Yet Nigro proposes the status of craft beer in U.S. Cellular to be the product of a simple sales meritocracy. The Midwest Brews stands emerged in 2011 in response to Sportservice observing craft beer's steady gains in market share. The name of the stand was not idly chosen, either, as Nigro's focus on locally produced beers extends to names he hopes will be familiar for fans of divisional rivals in Cleveland, Detroit, Minnesota and Kansas City. And while baseball teams naturally gravitate toward lighter, summery beers, Nigro only professes an interest in being able to field a complete variety, with one obvious qualification. 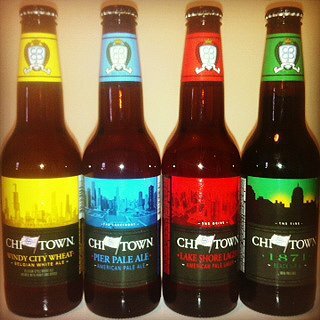 Taking a full-Midwest approach allows for the White Sox to make relatively safe selections of the biggest craft success stories of every nearby state (Great Lakes has reach throughout the Northeast, while Bell's is even sold in Puerto Rico), as they tweak their arrangement every year for optimum sales. While the Cohoon brothers could not guarantee sell-through for the hobby they had recently turned into a business, they credited an enterprising attitude from Sportservice and the White Sox as critical to their earning placement. “(Sportservice Director Matt Krauss) wanted to grow consumer awareness of craft beer at U.S. Cellular,” Cohoon said. Starting out with the capacity to fill larger contracts didn't hurt. In what Cohoon concedes is a small conflict with his brand name, Chicago Beer Co. has their beer brewed at Stevens Point's facility in Wisconsin. The arrangement allows them to avoid any troubles in meeting the distribution demands of a major league team, which Cohoon dismissed as an issue, but Three Floyds Brewery in Indiana specifically cited as a burden they were not ready to carry when they were offered the same opportunity. Product and selling in the market is important, but that will only get small-time brewers so far. 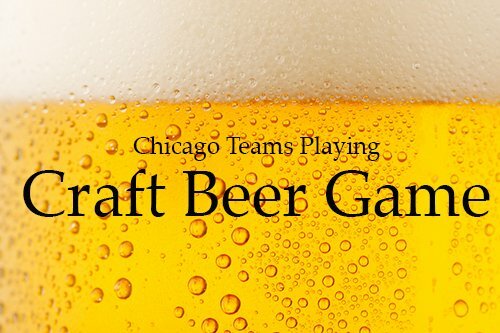 U.S. Cellular Field is still the only stadium Chicago Beer Co. is placed in, despite pitching their product to the Chicago Bears, and Cohoon understands that his company's current inability to provide the sales volume and capital to act as corporate sponsors—a reality for nearly all craft brewers—limits their appeal. It's a sound theory, since vendors who have taken the time to listen to what their market has to say on craft beer, have liked what they have heard. Major league teams would not be adopting craft beer en masse if they were not finding rewards when they did. The lines are filling up enough at Midwest Brews that Nigro could foresee the proper demand developing for another kiosk to be opened, even if he had to put in the upper deck out of concern for spacing. For the Cubs, there's optimism for change simply due to their state of frenzied transition. A still-new ownership group and stadium renovation plans both suggest a franchise that is pushing itself toward modernity and accepting the new realities and requirements of operating in this present-day baseball world. If their new sabermetrically-oriented front office is any indication of the franchise's approach at large, the transition to taking beer more seriously should be a smooth one.